Do you have an important decision to make but can’t decide between two good options? There are many interesting English expressions you can use in spoken English and written English. Today, we’re going to learn English idioms about decisions and priorities. The financial position of a company as seen in the companies accounts. The final result or outcome. e.g. The company signed a very important contract with its main customer. This would improve the financial position of the company and add profit to the bottom line. Michael resigned from the company after only 6 months in the job. The bottom line is that he did not enjoy the work and felt he made a mistake. The politicians argued about the new budget for several hours. 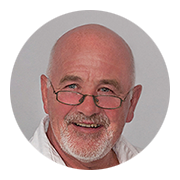 The bottom line is that severe cuts had to be made to reduce the countries deficit. e.g. Mary got a promotion because she worked very hard. She also received an increase in her salary and a bonus which was the icing on the cake. e.g. John received an invitation to attend a party. It was on the same day as the football game he really did not want to miss. He was in two minds whether to accept the invitation or not. e.g. David and Kate were arguing about the temperature that day it was very hot. Kate said it was 32 °C and David thought it was 33 °C. John told them not to split hairs, it was still very hot! e.g. If you’ve thought things through and are comfortable with your decision, just stick to your guns. e.g. No decision has been taken about where to build the new school, city council is still sitting on the fence. 7. TAKE A BACK SEAT – not to participate in issue or situation, allow other people to have leading position. e.g. I took a back seat and allowed my daughter to decorate the cake. e.g. The teachers were up in arms again over the new Junior Certificate reform. e.g. It was up in the air whether or not I would be going on this trip. e.g. 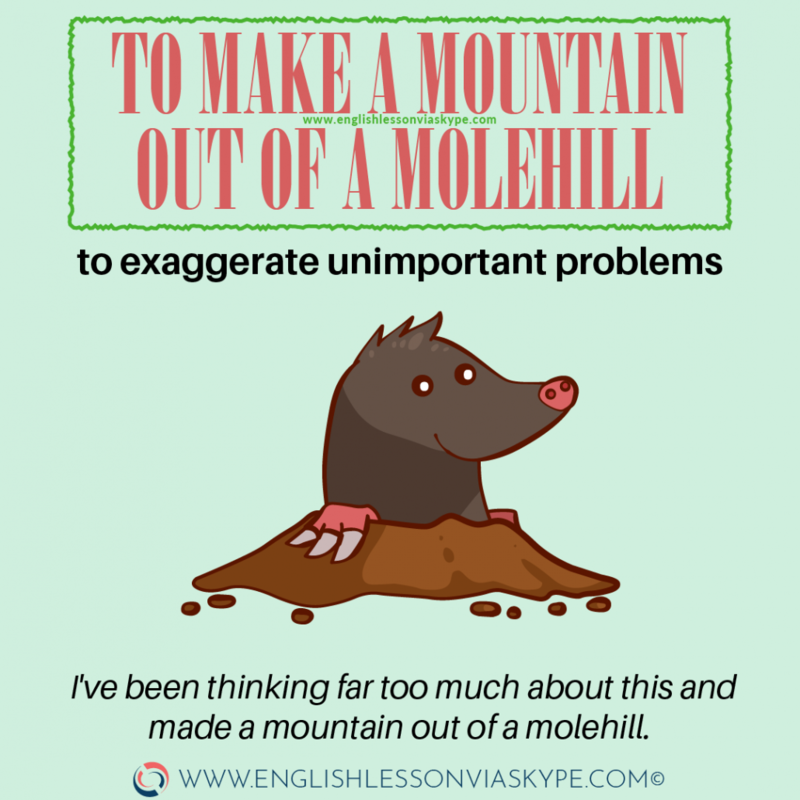 I’ve been thinking far too much about this and made a mountain out of a molehill. Now you can practice idioms about decisions in everyday situations. 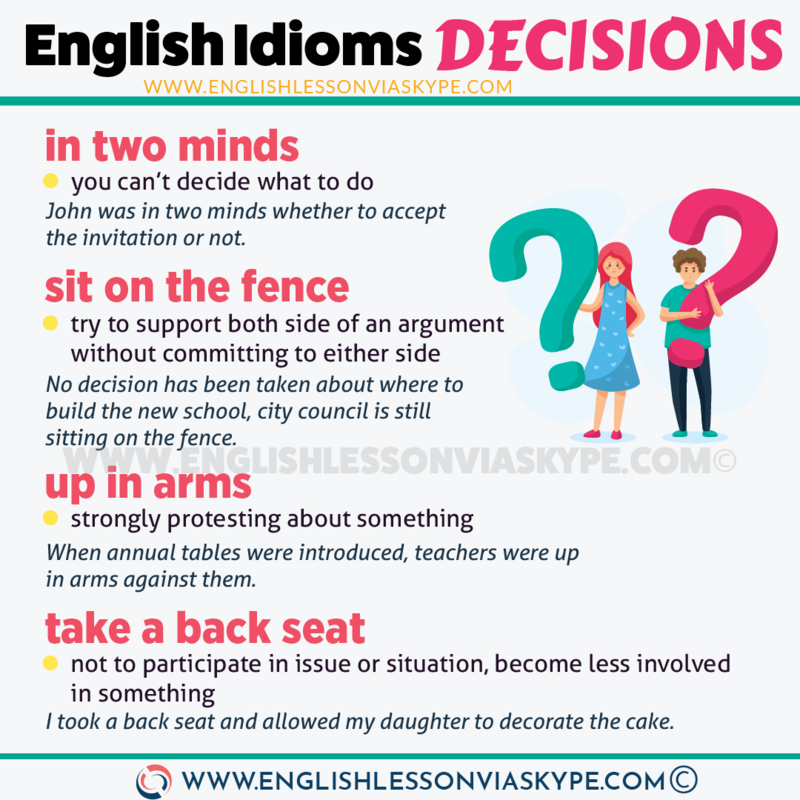 Share them with friends who might be stuck deciding what option to take or are unsure how to use English idioms about decisions correctly! 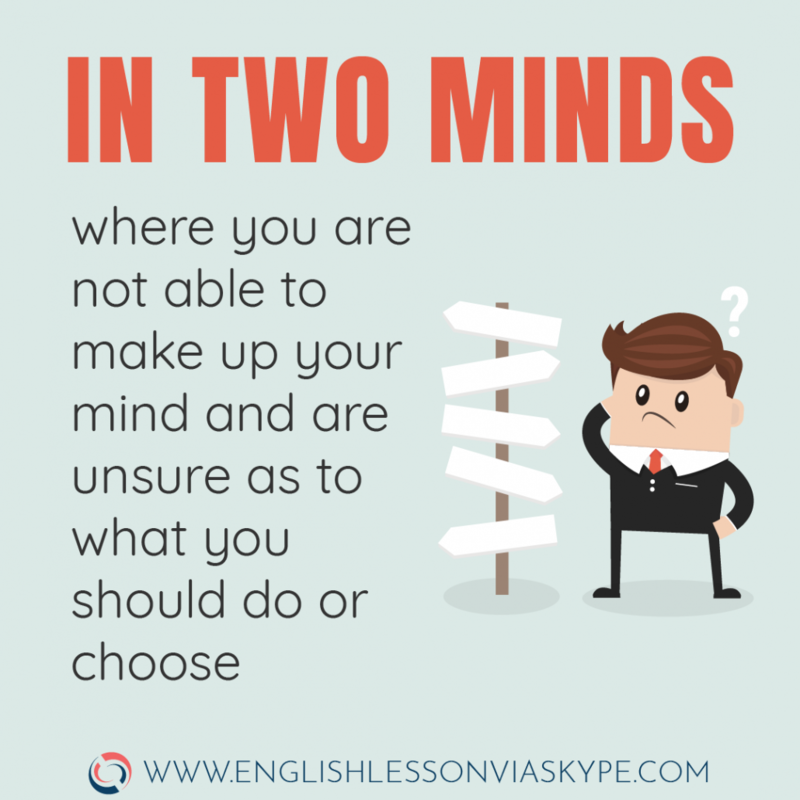 And as always, don’t forget to check our English Lessons via Skype prices.